DePetro.com: Will Rhode Island forgive Queena Raimondo? Is it over? 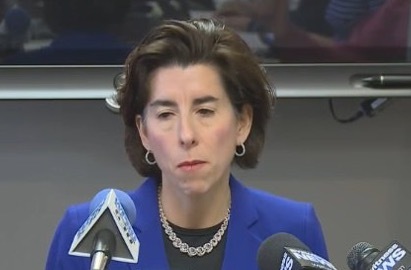 Can Rhode Island Governor " Queena Tollmondo" recover from her latest disaster? Team Raimondo continues to prove themselves as a bunch of incompetent buffoons who would have trouble patching a small pothole. Even among Raimondo loyalists, there is a growing feeling of uneasy regarding the political future of an individual once seen as ready for the national stage. Every Raimondo project seems to turn into a fiasco with the UHIP rollout being the biggest failure to date. Queena seemed a shell of herself at the " I apologize" press conference, a long way from when she was the new governor getting lunch with President Obama. How long did it take her to figure out Liz Roberts was the wrong person for the job? What sane leader would hire Brett Smiley as chief of staff? It took two years for her to realize Joy Fox was a clown. There are no "cranes in the sky" and President Trump would love to flip Rhode Island to a GOP governor in 2018. Things are bad when even Clay Pell won't rule out a rematch against Raimondo in a September 2018 primary. If Clay can take Uber and get the progressive vote, Pell has proven he can raise the money. Meanwhile, the Speaker just sits back, laughs and watches as Raimondo goes into a political death spiral of one mistake after another. Several Democrat insiders confide they believe Raimondo even hurt Hillary statewide in the November election and now Queena has become even more of a toxic force. How do you run for another term when your approval rating is below 30%? How would the public react if she attempted to host a town hall style gathering? For all the latest, listen to the John DePetro show weekdays now from 1:00-5:00 pm on 1540 AM, and follow DePetro.com.